White Fabric drum shade pendant in polished nickel finish. Both elegant and beautiful, this pendant can be used individually or in pairs to illuminate a room or provide focus for the task at hand. Great for kitchen, dining room, bedroom, and foyers. The height of the pendant can be adjusted - choose from the three lengths of rods or use them all. A cascading tapestry of delicate chain metal sets this majestic collection apart. With a handcrafted, polished nickel frame weaving elegantly from its base, this fixture is sure to be the focal point of any room. 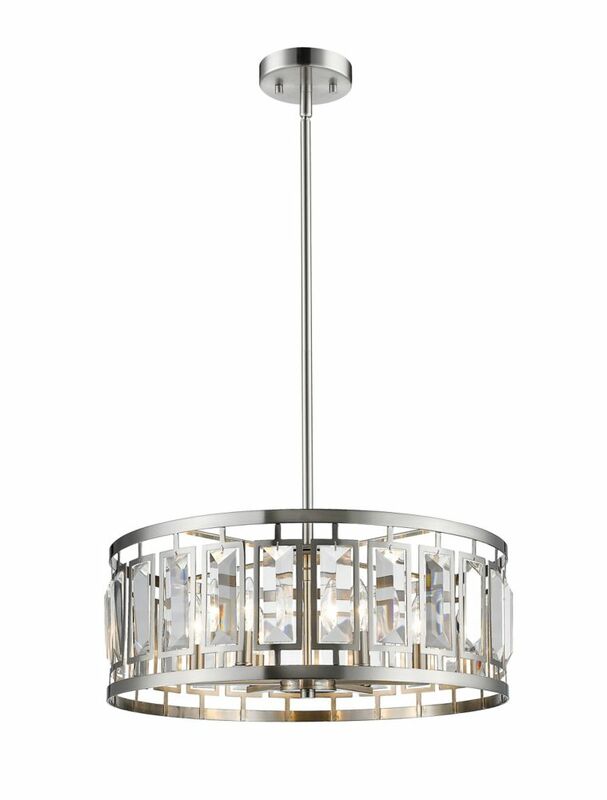 6-Light Brushed Nickel Pendant with Clear Crystal Accents - 23 inch This pendant will update your home with its eye-catching design. Featuring a brushed nickel finish and clear shade(s), this fixture will accommodate a variety of dicor styles. With its easy installation and low upkeep requirements, this pendant will not disappoint.